Caminhe entre as espetaculares Montanhas dos Cárpatos em uma visita guiada a pequenos grupos do Parque Nacional Piatra Craiului a partir de Brașov. Siga uma das duas rotas em uma caminhada de 5 a 6 horas através de prados alpinos, florestas perfumadas e aldeias campestres que parecem intocadas pelo tempo. Veja o cavernoso Gorge Zarnesti e conheça as tradicionais indústrias rurais de produção de queijos e pastoreio. Reabasteça com comida romena saudável em uma cabana de montanha ou uma aldeia local. Os números são limitados a oito pessoas para uma experiência de caminhada personalizada. Se o tempo permitir, visite o Castelo de Bran, conhecido como o Castelo do Drácula, no caminho de volta para Brasov. Não se preocupe em se perder no parque nacional - este passeio guiado a pé cobre você. Situado entre os picos escarpados das montanhas dos Cárpatos, o Parque Nacional Piatra Craiului oferece a oportunidade de experimentar a beleza cênica e os modos de vida rurais da Romênia que permanecem praticamente inalterados no século XXI. Vá até o centro de Brasov para conhecer seu guia local e suba a bordo de um veículo com ar condicionado para a viagem de 1 hora até o parque. Ao longo do caminho, aprenda sobre a geografia e a história da região e decida com seu pequeno grupo qual das duas rotas de caminhada você gostaria de fazer, dependendo das condições climáticas e das habilidades do grupo. Espere cobrir de 6 a 9 milhas em 5 ou 6 horas, incluindo uma parada para o almoço. Veja Itinerário abaixo para uma descrição detalhada de cada rota. 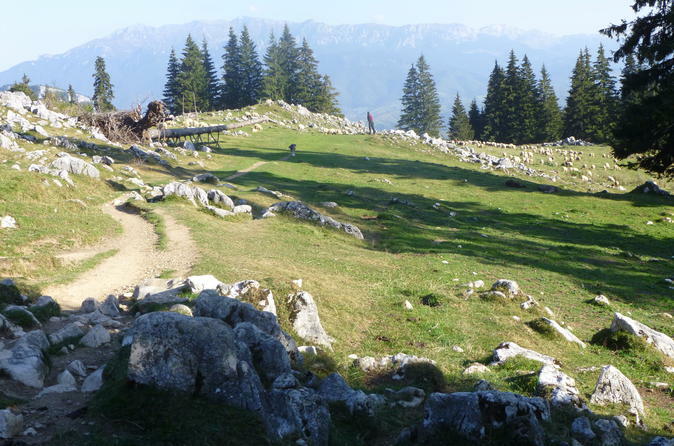 Após a sua caminhada, você tem a opção de parar no castelo de farelo de conto de fadas no retorno a Brașov (por conta do visitante). Se o grupo concordar, explore os grandes salões góticos e torres desta fortaleza no topo da colina, que tem laços com a inspiração da lenda do Drácula. Being winter, my friend and I were the only ones on the tour and were essentially treated to a private guided tour! Our guide Chris allowed us flexibility in essentially designing our own tour and resulted in a lovely, personalised day out! A great way to spend the day exploring the area. Marian was the best! If you are thinking if you should book this, don’t hesitate and just do it. The landscape was breathtaking and the hike was enjoyable, even in the winter. I didn’t bring hiking poles, but luckily Marian carried extras for me. I even booked a 2nd trip them the next day! I would highly recommend this full day hike up in to the mountains even on a hot Saturday in September!. The national park is beautiful with breathtaking views from the top. We were very lucky as we had Bogdan as our guide. He is very enthusiastic, energetic and experienced with lots of tales to tell. Remember to take walking poles. They are invaluable on the way back down! Bogdon led this hike through the beautiful park. I was afraid of bears and he told me about the very interesting history of Romania to get my mind off of them. He is extremely knowledgeable about the area, the history, the people, etc. The scenery is breathtaking and we had lunch had a little cafe in the middle of nowhere that had the most wonderful soup I think I've ever had. 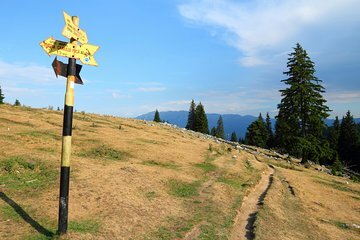 I would recommend this hike to anyone visiting Brasov. And, no, we didn't see any bears. Beginning of December. The mountains are fully covered with snow create a fairy tale atmosphere. Beautiful hiking! And a very good guide, thanks Bogdan! Wonderful experience and wonderful tour guide. Good weather, great scenery and a very knowledgeable and proficient guide in Bogdan. A really wonderful day out. It was perhaps a little difficult for him as I was so much older and slower than my day trip companion. But speaking for myself I had a beautiful day with lots of laughs, enjoyed a delicious soup lunch at the refuge and got home safely. What more could you ask? We had such an amazing time on this beautiful hike. Would definitely recommend it to those looking to escape the city for a day and get outdoors. Our guide Cristian was very informative and funny! We opted for the more difficult route and it was the perfect level of challenge! Beautiful place! Could not have asked for a better trip. Our tour guide, Christian, was insightful and kind. I definitely recommend this tour and specifically Christian as the guide.